A complete household relocation or an Excess Baggage relocation of 1 box, We are the firm for you! No two relocations are the same. The circumstances, specialist requirements or logistics make every job unique. Speak to us at Copsey! Stressed by the thought of relocating? Call Copsey today to let our expertise and knowledge take the burden from your shoulders….We are here to ease your mind. Book a survey around 3 months in advance of your relocation in order be prepared when you get the go ahead! We are a family operated company of professionals and have a wealth of experience in handling our clients prized possessions. 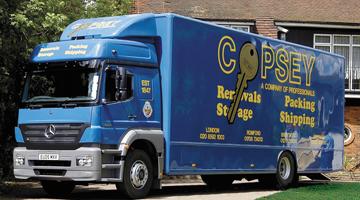 As one of the largest family owned and operated Removal companies in the UK, Copsey is a company of professionals that have been established since 1847. So, whether you are moving home in the UK or Relocating worldwide, from a small apartment, large house or multiple properties be assured Copsey’s can tailor to all your requirements condfidently. Being established since 1847 enables us to offer both our clients and worldwide network of agents over 160 years of experience and knowledge. Not only being present through the evolution of the relocation industry but being an integral part of it, Copsey has built on solid foundations a unique and quality relocation service. Heritage and family values have been paramount from the beginning. All aspects of the relocation service can be covered by Copsey whether Domestic, European, International (Import/Export), long term or short term Storage but it doesn’t stop there. Copsey are specialists in Heavy Lifting work, safes, machinery, Grand/Upright Pianos and even the delicacies of Fine Art and Sculptures. An experienced and professional surveyor can visit your home to assess the specifics of your relocation. Moving home is reported to be the third most traumatic experience in our lives but Copsey will make it a positive experience and a time to enjoy. Put your confidence in us! Packing materials are of paramount importance for any relocation. Whether you are relocating with Copsey or not we offer an extensive range of quality materials. From crating your finest art and most delicate glass to relocating your vehicle or boat, Copsey are the one to trust. Secure, safe and affordable our unique and efficient containerised storage is available for anyone, not just clients that are relocating with Copsey. Arrange for a free no obligation meeting with one of our removal experts.